We need you to pack the courthouse for 1 morning for an important legal fight to end part of the injustices of immigration detention. As you know, nearly 200 migrants jailed indefinitely without trial or charge, have been waging a courageous struggle against immigration detentions and deportations in a max-security prison in Lindsay, Ontario since September 2013. Those migrants have gone on hunger strike, boycotted their detention reviews, refused to enter their cells and organized despite the violence and alienation of prisons. 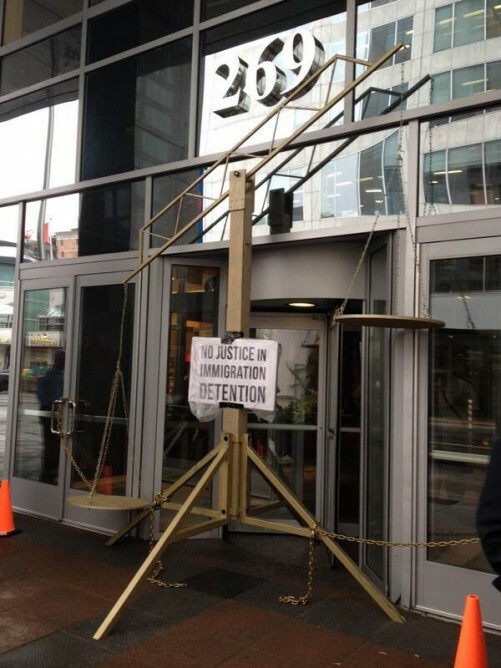 To support their struggle, the End Immigration Detention Network, has organized rallies and petitions, gone to the United Nations, uncovered deep discrepancies in the detention review process, and worked to shed light on the injustice of detentions and deportations. The spotlight on the abuses inherent in the system has shone even brighter as a result of Lucia Vega Jimenez’s death in immigration custody in Vancouver, in December 2013. Our struggle is entering a critical new phase. In this coming week, we need you to pack a downtown Toronto courthouse, for an innovative court challenge we are launching. We cannot reveal the details of this step yet, but we urge you to fill out this form, if you are available between 9am and noon, on December 11, 12, 15 or 16. We will only need all of you to be there for one of these mornings. We will email you details on Wednesday, December 10th, 2014. Your presence in the courthouse will be critical in showing broad community opposition to immigration detention. Please fill out this form, and share this call out with trusted friends and family members.